In reality, Muggeridge argued the very act of pursuing happiness will in fact ensure that we will never achieve happiness at all. Instead, happiness comes unbidden. It is a gift. We immerse ourselves in particular person, thought, book, or what have you, and suddenly we realize, “I’m happy.” Adherence to the Declaration’s view of happiness would lead us down a path of restlessness, materialism, cynicism, or flight into fanciful and frightful utopia’s. I could not find the original clip of this on Youtube. The clip below deals with an entirely different question, but it’s still worth watching. Whether your agree with Muggeridge or not (and he makes another controversial assertion), we must all agree that Muggeridge possessed the greatest English accent of all time. I thought of Muggeridge on happiness when reading a brief post from David Derrick about individuals or nations that seek to “leave their mark upon history.” In it he quotes Toynbee, who mentions that since Austria and Bavaria parted company centuries ago, the two have pursued different paths. Austria looked to do “great things,” and they did achieve a kind of greatness with the city of Vienna. But they also involved themselves in numerous wars that they often lost. They got crushed by Napoleon in the 19th century, then by Russia and the allies in W.W. I. Toynbee’s thoughts in the post above date from 1934. In the few years that followed Austria continued to try and “leave its mark” by joining up with Nazi Germany, and of course that too ended very badly. I have some friends who visited Austria years ago, and they saw this same attitude of “we’re special” at work in those they met (though in the modern context it had the manifestation of strong hostility to foreigners and immigration). This approach has not helped them find their place in the world. It appears that pursuing a place in “History” might be as futile as pursuing happiness. Hitler was fond of Bavaria, and the Nazi’s held many of their rallies in the Bavarian city of Nuremberg. The White Rose, the heroic student resistance movement to Nazism, had its origins in Bavaria. Before examining these points, we should note that no country, just as no person, should be judged only by their sins, no matter how bad those sins may be. Still, defenders of Bavaria’s relaxed approach to their own history need to examine this period. Points two and three stand out most sharply. As to Nuremberg, Hitler may have held rallies there simply because he was known to be fond of Bavaria. On the other hand, Bavaria may have been a stronghold of Nazi power. The White Rose may have originated in part due to a strong underground of resistance in Bavaria, or it may have arose for entirely other reasons. Without further knowledge (and I have none), we might say these two factors cancel each other out. I think the first category may hold the most weight. In the Weimar years Germany swayed to a fro between extreme ideas and stark resistance to the Versailles Settlement. Both Nazi’s and Communists, for example, sought to “leave their mark” upon history. The fact that the German people went with the Nazi’s shows their general bent towards radicalism. The “Bavarian People’s Party” in contrast, wanted to bypass all of the immediate debates and return to traditional concepts of governance. They contemplated separation from the rest of Germany to achieve this, not unlike the “Bloodless Revolution” in England in 1688. Perhaps they understood the secret that Muggeridge knew, that seeking “History” can hold just as much danger as seeking happiness. This week spent some time discussing the elements of ‘golden ages’ and the factors that went into the birth of what we know as Periclean Athens. 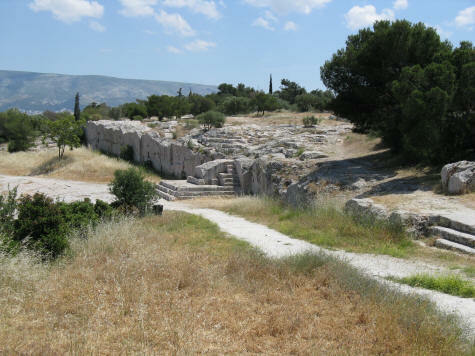 From 480-431 B.C., Athens experienced an explosion of creativity and culture perhaps unparalleled in human history. Much of what we consider to be modern democracy, philosophy, literature, drama, science, and architecture have many of their roots in this period and place. A burst of confidence based on a defeat of a large power — you were the underdog and emerged on top. The unexpected victory serves as a validation of your uniqueness. An educational base to build the cultural explosion on. There has to be some kind of literate and curious population base to build on. The willingness to tolerate the possibility of new ideas, which usually has something to with #1 listed above. With all these factors possibly needed (and possibly more that I have not accounted for), golden ages do not come often in history, but they leave their marks long after they disappear. They had much more direct participation from their citizens in government than modern Americans. The average citizen would not only vote, but could also speak in the Assembly. Most citizens would probably serve in some political capacity during their adult lives. The very fluidity of their democracy opened up the real possibility that the checks and balances of law could easily be overridden, as happened on a few occasions. All citizens of a certain age are eligible to vote. We have minority protection built into the system. Representative government has tended toward an oligarchy of the rich, with powerful interests controlling both parties. This, in turn, has led to a real distance between Government and the people which results in an “Us and Them” attitude. I will look forward to their debate when we return next week. 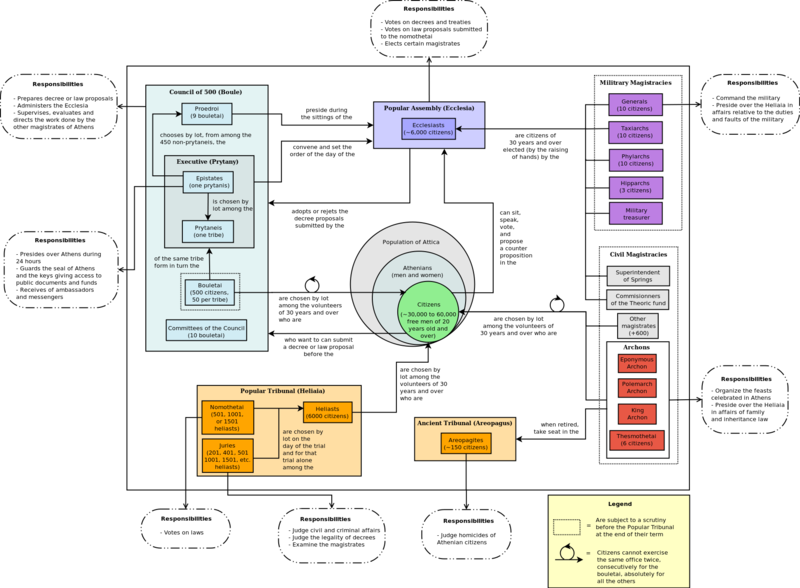 Below is a very detailed chart of the ins and outs of Athenian democracy for the very interested. We began the actual fighting of the Revolutionary War this week, with a focus on the generalship of George Washington. But we began by looking at the tactics employed by the colonials at the Battle of Concord. After the British broke through the lines like a knife through hot butter at Lexington, the colonials changed tactics after the British abandoned their search for weapons in Concord. Rather than meet them out in the open, the hid amidst the treelines, taking potshots and then melting back into the woods. The British had no effective way of countering this. This infuriated the British, of course. This was not how men fought! What kind of coward fires from safety and then runs away? Battle was meant as a test of honor, solidarity in the ranks, and courage under fire. Fighting as the colonials did at Concord might be akin to one team poisoning the water of their opponent. If they then won the game, would we call that victory? For the Europeans, for battle to be decisive, for it to mean anything, it must be ‘fair.’ Victory without ‘fairness’ solved nothing. Students wisely countered with the fact that this analogy of a sports team doesn’t quite add up. First of all, it’s against the law to poison water, where there is no law saying that armies must line up in the middle of field. Secondly, why should the colonials have to fight on British terms according to British strengths? The colonial troops should be free to do what they do best. These are good arguments. What happens when we apply them to our current situation in “The War on Terror?” We would all wish that the terrorist radicals would all line up in a field somewhere. If this happened, the “War on Terror” would be over in about 15 minutes. Naturally, they possess enough intelligence not to do this, so they choose other tactics. Does this make them cowards? Are they “playing fair?” Where are the differences? Some said that the differences lie in the treatment of civilians, and this is an excellent point. Does the same difference apply to the Ft. Hood shooting a few years ago, where only military personnel were targeted? It’s important for us to realize (returning to our original context) that for the British raw military victory did not count in the same way that honor and integrity did in battle. Wars happened, but wars should take place within the confines of civilization, not outside it. How one fought was in itself a victory of sorts, and could not get separated from the tangible results on the field. During our look at Washington, we noted that he won only 3 of his 9 revolutionary war battles. Previously to the American Revolution, he may have been responsible for the Fort Necessity disaster with the French, and he accompanied Braddock on his ill-fated attempt to capture Fort Duquense. Does he deserve his high reputation? Some years ago I came across a book entitled, ‘The 100 Greatest Generals of All-Time’ (or something very close to that). Lists are always fun for me, so I opened it out of curiosity. As one might expect the usual suspects of Julius Caesar, Alexander, Napoleon, Ghengis Khan, etc. could be found in the top 10. But his number 1 general of all-time? George Washington. Many of the generals in the list accomplished a great deal militarily but failed politically (i.e. Alexander, Julius Caesar). Some had short-term political success, but could not make it last (i.e. Napoleon). Some of the generals (again Alexander and Caesar) inherited what was likely the best army in the known world at the time and fought against weaker opponents (this could especially be said about Alexander). By contrast, Washington faced the best with an untrained army with weak political support. As commander-in-chief, not only did he win the war, he turned that victory into lasting political success for his side. Not only did he help usher in a new political era, he did so without seizing control himself. Washington had a solid understanding of the fact that the Americans only needed to ‘not lose’ the war to win it. He knew that keeping the army intact and functional was more important than risking the army in unsure scenarios. Orderly retreat could sometimes be the better part of valor. Most military men can’t do this consistently even when intellectually they know it’s the right thing to do. Washington did so, and distinguished himself thereby. Former Georgetown Hoya basketball coach John Thompson says on occasion, “I don’t want to know how many points somebody scores in a game. I want to know when he scores them. What do his points mean for the team in a given situation?” In the same vein, Washington knew how to minimize the impact of his defeats and maximize his victories. When things looked bleak in the winter of 1776, for example, he came through in the battles of Trenton and Princeton. It would be years before his next victory at Yorktown in 1781, but the British surrender there basically gave America its independence. As I mentioned previously, it is possible the author listed Washington so high to distinguish his book from others. Still, I feel he has solid arguments to at least rank him highly. I wanted to use our look at Washington to introduce the concept that in war success can come in many ways. Since war is ultimately a political act, the battles themselves are simply one extension of the conflict. 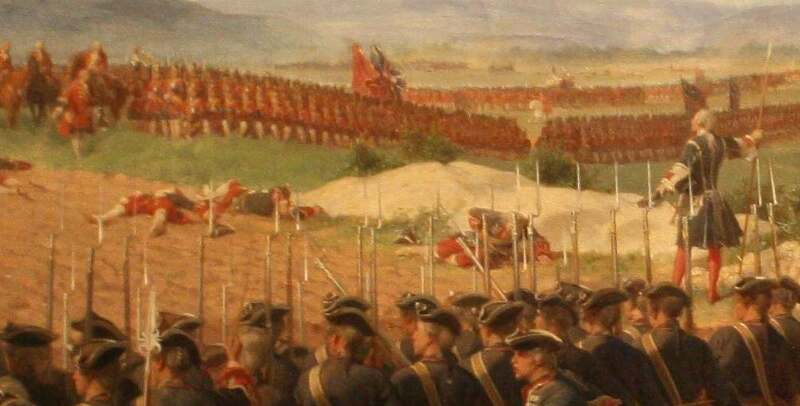 When we think about war in broader terms, we see how many of England’s advantages (such as an elite professional army) meant little in the political context of the Revolution. They had the unenviable task taking someone who didn’t want to be your friend anymore and making them a friend. Would beating them up do the trick? Over the previous 10 years (1764-75) the British proved politically inept with the colonies, so a political solution would not come easily for them. If they went the route of force more or less exclusively they would need to absolutely pulverize the colonies so badly that further resistance would be physically and psychologically impossible. As long as the Americans kept their heart beating, they could outlast England. Washington, I think, understood this to his advantage. Next week we will look at the battles of Saratoga as well as the Declaration of Independence. It might be a good sign when those one admirers disagree among themselves, but for me it can be painful. Few have taught me more than G.K. Chesterton, but I also like Edmund Burke. Had the two co-existed they would not have been friends. Chesterton believed that Burke’s innate conservatism meant that he disapproved of any change at any price, or that whatever political and social order in existence had divine sanction behind it. Burke tended towards the stodgy, but I think Chesterton overreacted. 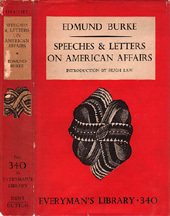 I see Burke as a champion of workable, reasonable policy, an Enlightenment man in a Romantic era. Perhaps this is what Chesterton, the art school dropout, could not forgive in Burke. Practicality can be maddening. Burke’s marshaling of logic expressed in dense Enlightenment style can infuriate, all the more so when he’s right. His Reflections on the French Revolution is a hard read but deserves its acclaim for its early prediction of all that would go wrong in France. When I saw his Speeches and Letters on American Affairs for sale cheap, I felt I had to pounce and take a dose of good sense, albeit in protein bar form. I hear the honorable gentlemen say, ‘I don’t care how we got into our predicament. I only care now how to get out of it.’ . . . No possible good can come from this attitude towards our situation . . .
Burke calls England back to first principles. Is the problem English debt, or colonial recalcitrance? By 1774 the revolution had nearly begun, and England scrambled to make things right. Burke saw England concerning itself only with dealing with whatever situation lay in front of them. Constantly reacting, they never reflected. One can’t solve a problem until you understand the problem, and this England never bothered to do. In this case, Burke calls England to look in the mirror. However bad the colonies have acted, we ourselves first damaged the relationship by our own actions. Their policy adjustments thus amounted to little more than course corrections to avoid icebergs, when you should think more about heading south in the first place. Besides, some of the things taxed were so trivial, that the loss of the objects themselves and their utter annihilation out of American commerce would have been comparatively as nothing. Perhaps the English had a right to tax the colonists in some respects. But Burke rightly calls out the English for foolish and paltry duties on things like playing cards. Such taxes only aggravate and obscure whatever good purpose you might have.
. . . but whatever it is, [you] gentlemen will force the colonists to take the teas. You will force them? Burke admits that the Tea Act had many benign and even generous provisions. To then use force risked ruining everything. Had they left well enough alone they would have collected plenty of money. They reduced duties on tea, but then used force to ensure they would collect it. Again, Burke argues that it appears that the true purpose of the British is to assert their authority rather than enrich their people and make peace. This gets to the root of the problem itself — England had its priorities all wrong. Force over time wastes away. Burke continues . . .
To repeal by the denial of our right to tax in the preamble would have cut, in the heroic style, the Gordian knot with a sword. The English piddled around the fringes of the various taxes they imposed, modifying this or that over time. True, sometimes they lessened the duties instead of increasing them, but this yo-yo act ensured colonial aggravation. Had they simply denied their right to tax altogether they would solved the problem immediately. Nor would it have cost them money in the long run. Burke cites the exponentially increasing British imports pouring into America over the past 50 years. Forcing certain duties, having the Americans object, followed by the inevitable British penalty of closing ports, has the British run the long way round for nothing, or less than nothing. Much better to act on principle (which the colonists would respect) and be done with it. Freedom is to them not only an enjoyment, but a kind of rank and privilege. . . . I do not mean, Sir, to commend the superior morality of this sentiment, which has at least as much pride and virtue in it; but I cannot alter the nature of man. Burke acknowledges that some colonists talked far too much of liberty, perhaps without any sense of responsibility. John Wesley certainly thought so. Slavery proves it. 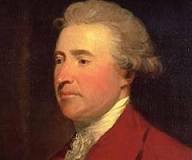 But Burke realized that England had no ability to change what the colonists believe. Force would certainly not accomplish this, and likely make it worse. But England would not back down, because at least on Burke’s reading of the situation, they cared more about asserting power than peace. Perhaps they cared about peace, but it would have to be on their terms. The outbreak of war and its result proved how wrong they were, and that sometimes stodgy, methodical wisdom is best after all. I can’t assert this with blanket accuracy, but it seems to me that whenever nations disconnect from reality by doing one thing not for the purpose of the thing itself, but as a placeholder for something else entirely, the results never pan out. One thinks of Johnson’s bombing in Vietnam. No one thought the actual bombing particularly effective, but we assumed it would send a political message to the North. We know how that worked out. Burke’s message to live in reality stands the test of time.